This video was shot with a Sony digital still camera. ; From the front door of the Whistle Stop Cafe. Tired of the same old fast food establishments that dot the Interstate Highways across Texas? Want to rub elbows with real people that eat real Texas food. If the answer is yes, here's what you need to do. Exit to the downtown area of any Texas County seat and right across the street from the Courthouse there will be a place to eat. There are 254 county seats in Texas and 99% of them have a good eating establishment within walking distance of the Courthouse. Livingston, Texas in Polk County is no exception. 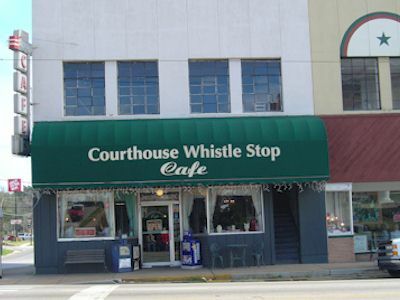 Right across the street from the Polk Count Courthouse in is a very typical example, The Courthouse Whistle Stop Cafe. The menu is pretty typical fare with a slight variation in that it featured some Italian dishes. All I had to do is decide which dish to "test". Should I try the Italian? Naw, I'm Texas Bob. What about a cheese burger with jalapeño's, naw, I'm hungrier than that. So I went with the Texas staple, Chicken Fried Steak with cream gravy, you won't find this on the Adkins diet. The service was fast and courteous. In an matter of minutes, just as I finished my salad, with "Ranch" dressing, my Chicken Fried Steak had arrived. Now here comes the hard part. I almost always forget to take the picture before I eat. I'm too hungry to remember and also people look at you a little funny when you whip out your digital camera and start taking pictures of your food. You get, "Is that guy from the health department?" looks, but when they see me eat they know that it's ok. 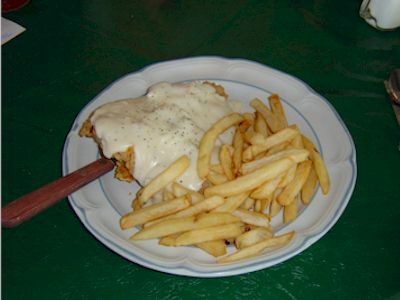 The other thing is Chicken Fried Steak in not very photogenic. I think its the cream gravy, the way it reflects the light back. However to the trained eye this Chicken Fried Steak looks good and it was good. Besides the food there are a few other things that you need to know about The Courthouse Whistle Stop Cafe. Attached and adjacent to the Cafe is an Antique Shop. Go ahead and go through it while your there. Your wife will like it and they do have nice "Texas" stuff too. They do feature Italian Food too. I didn't try it but if they can get their cream gravy just right for a Chicken Fried Steak, I'm sure they can do Italian. There is plenty of parking behind the Cafe.